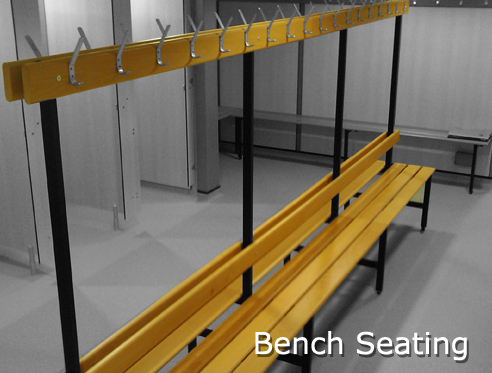 The bench seating range offers the finishing touch to any changing or welfare facility. It’s straight line design incorporates quality fixtures, fixings and finishes to give a stunning overall appearance. The extreme strength and rigidity of the range ensures that the demands of high usage areas are surpassed without compromising style or aesthetics. 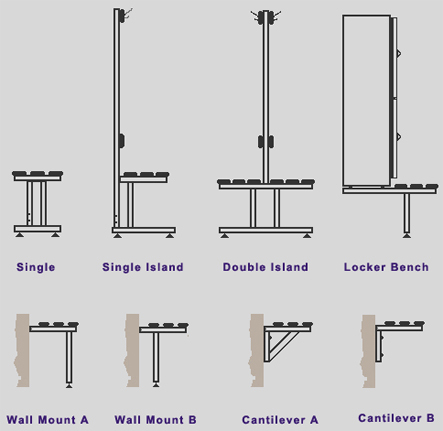 Over the following pages you will find details of our standard bench seating options. Very often we find that our clients require a bespoke bench solution i.e. size, length, width, height, finish match to existing, curved benches etc. If you have a ‘bespoke’ bench seating requirement please call our sales/technical team and we will be pleased to assist you. Oliveti Gem Bench Seating complies with the latest DDA recommendations and sport England guidelines. Our products are fully supported by technical documents which incorporate full details of specification, sizes and available accessories. The framed structure is manufactured with a robust 40mm x 25mm mild steel box section which is predominantly 'off-site' welded to aid speed of assembly. Conversely 'on-site' assembly is reduced to a minimum, cutting costs considerably. All frames are fitted with adjustable feet and floor fixing brackets as standard to accommodate uneven floors and to ensure structural stability at all times. The capping of open frame ends prevents the ingress of moisture, adds finess and removes sharp contact areas. Optional coat rails and hooks can be supplied for increased in-service performance. Rustproof threaded inserts, stainless steel bolts and nickel brass fixings are incorporated to ensure corrosion free joints, thus eliminating those all too commong 'rust' marks during the system lifespan. Frames are available in any RAL colour. Bench seating frames available in a chrome finish if required. Anti bacterial protection can be achieved by applying anti bacterial powder coating to the mild steel framework. Frame colours are applied in accordance with 1SO9001 standards, which guarantees a consistent and hardwearing first class product finish. Plascoat PPA 571 is one the most durable and versatile coatings available for extereme installations such as swimming pools.